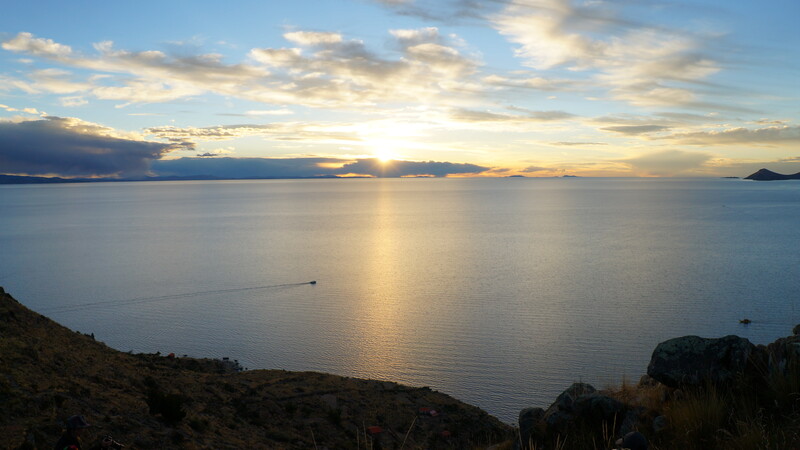 The Incas believed that Lake Titicaca was the place the world began, when the god Viracocha came out of the lake and created the sun, the stars and the first people. 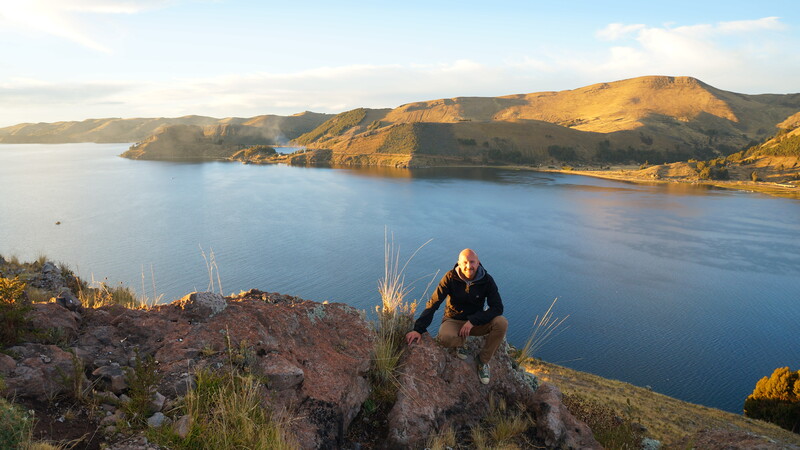 For us, the lake certainly did have a mythological magic about it, and a striking beauty with its glistening cobalt blue waters and surrounding sun-drenched, fertile valleys. 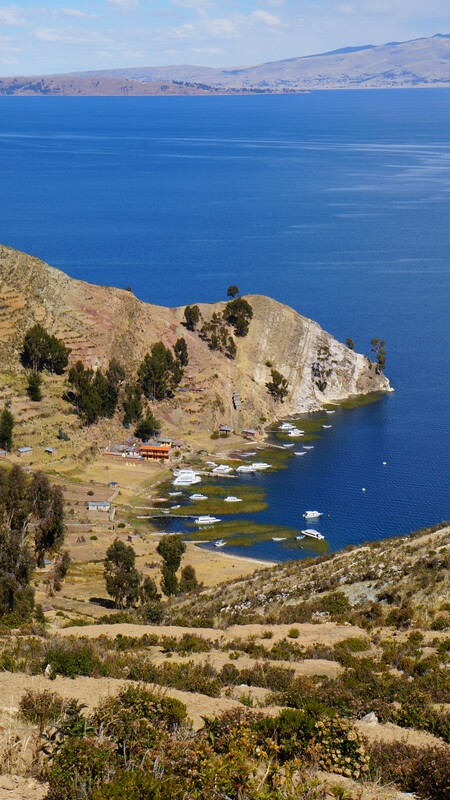 Lake Titicaca is situated at 3,820 metres above sea level and spans Bolivia and Peru. 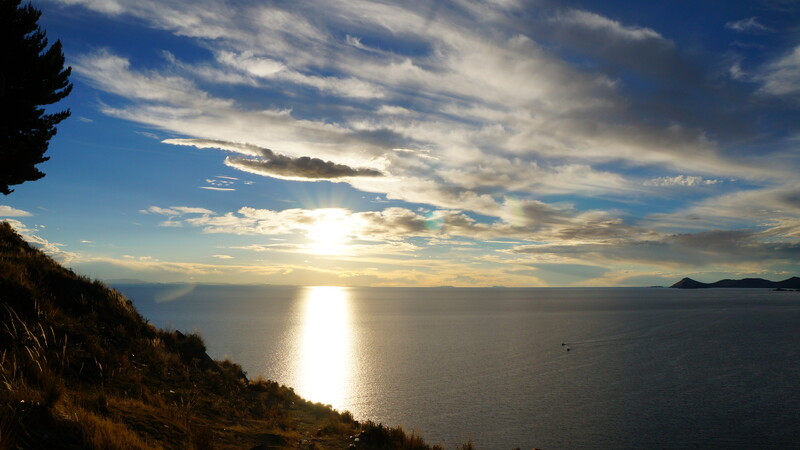 It is considered to be the largest lake in South America covering an area of 58,000 squared kilometres and at its deepest point is 281 metres. On the north-east side of the lake some of the highest peaks in the Andes, the snow-covered Cordillera Real, rise dramatically out of the horizon and make a beautiful backdrop for traditional Aymaran villages and farms along the shore, where the way of life has remained unchanged for hundreds of years. 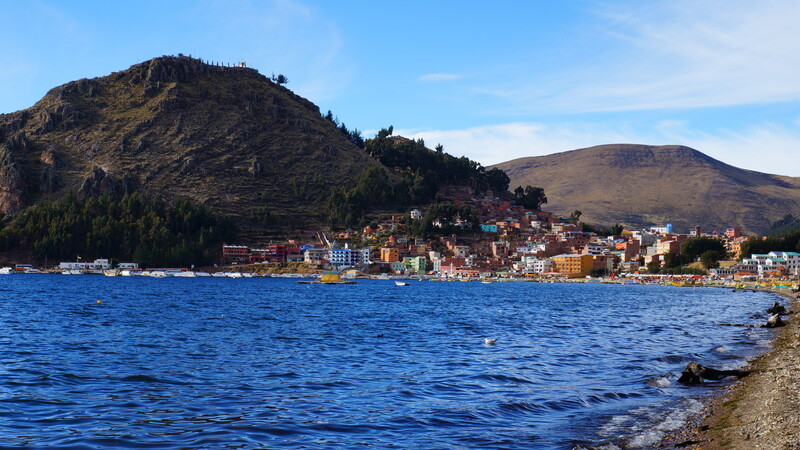 The Bolivian town of Copacabana sits on the southern shore of the lake and is a mecca for holidaying locals and tourists alike. There is an excellent selection of cheap places to stay and we found our best bargain of the trip so far in Residential Aransaya’s spacious double room with wooden floors and a small desk along with a sun drenched, plant filled patio all for 50 Bolivianos (7 USD) per night. Copacabana is nestled between hills and the colourful houses are neatly stacked in ascending rows. Standing at the far edge of the beach looking towards the village, it reminded us of a small, chic fishing village in the south of France. However, upon closer inspection there was more of a fun and slighty tacky seaside feel to it, which was more akin to Blackpool. Swan shaped pedalos lay on the beach ready for rental, children played on trampolines and vendors sold candy floss and toffee apples. 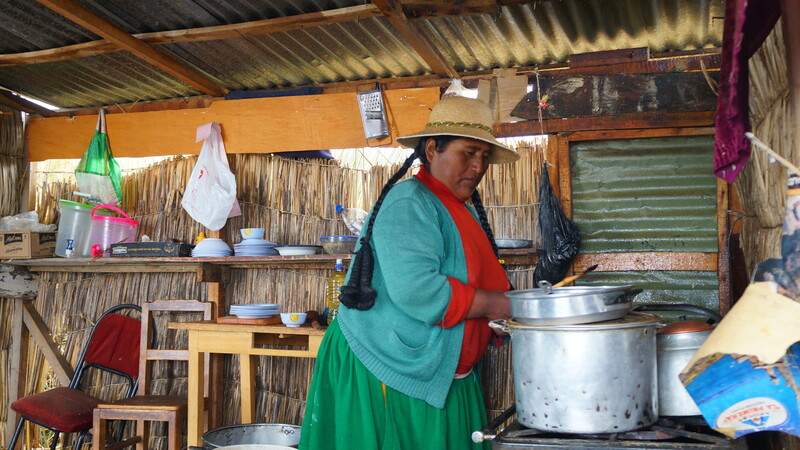 A long line of open fronted chalets fitted out with plastic tables and chairs and run by local families served up the regions speciality – freshly caught Lake Titicaca trout. Baked, grilled or fried and served with a simple squeeze of lime, a tomato salsa or a buttery garlic sauce, this delicious dish tantalised our taste buds. 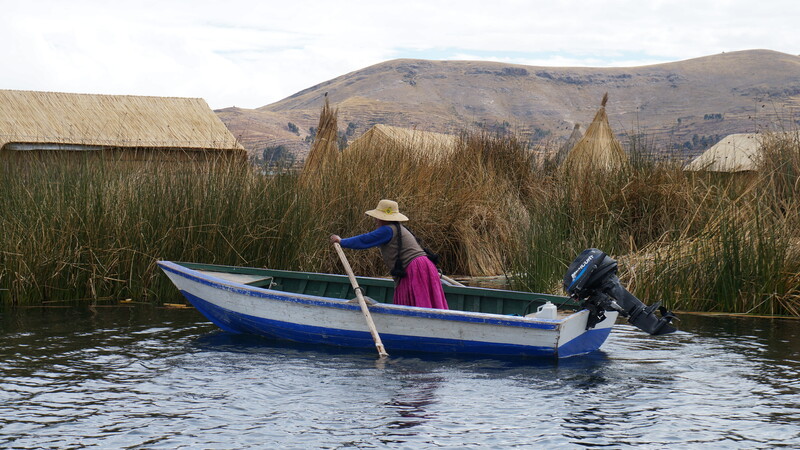 Fishing and farming continues to be an important part of life for the local people living on Lake Titicaca. Small wooden boats bob up and down on the shimmering water as locals cast their nets and haul in their catch. In the fields bulls strain to pull metal ploughs through a carpet of brown earth and farmers bend over and over to collect their crops. The lake is a magical place and it’s common to see spiritual ceremonies and rituals taking place around the village. 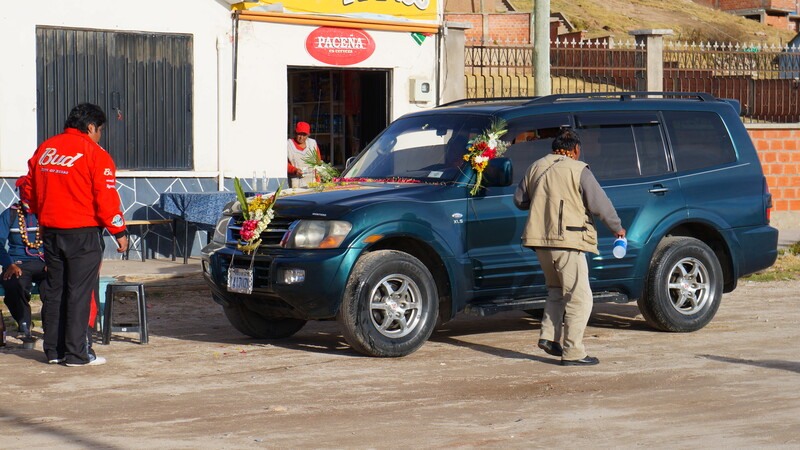 Along the promenade we comically witnessed cars being elaborately adorned with flowers and blessed with holy water to protect all those who travel in it – and let’s face it, with the way Bolivians drive, they need all the blessings they can get! 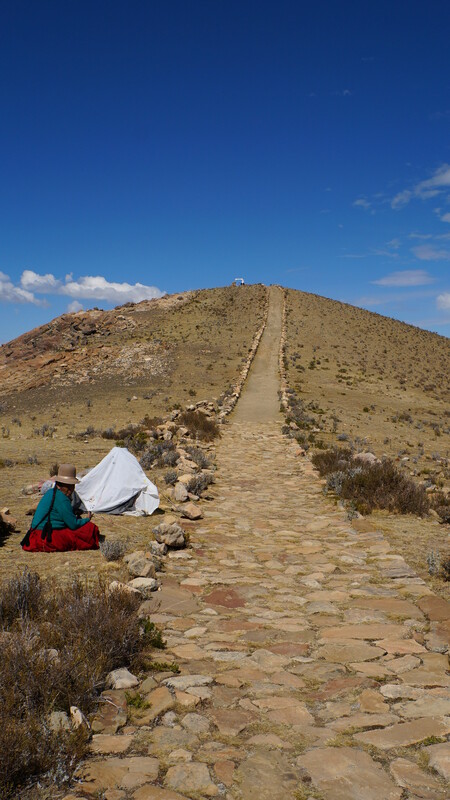 On one of the hillsides we saw a young couple sat in front of a shaman who was burning incense and offering quiet prayer. There were no smiles and giggles from the couple as there would have been from if we were sat in their place but instead they truly believed in the spiritual world and that this sacred ritual would bring them what they wished for. The sunsets we saw whilst staying in Copacabana were incredible. 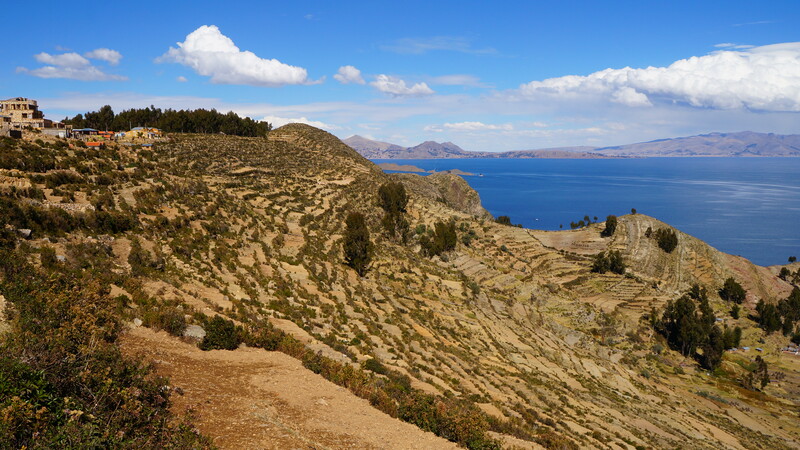 One evening we made the steep climb to the top of Cero Calvario and peered down on the beautiful lake – dotted with sandy bays and hosting a number of small islands – the landscape had a dreamlike quality to it. It was probably the lack of oxygen to our brain but the sun seemed to be swollen and glowed a more intense orange than before. The whispy clouds and swirls of colour in the sky gave added drama to our photographs. The lights in Copacabana had started to be turned on and their twinkle reminded us that there was dinner to be eaten and beer to be drunk. So, with the multi-coloured light show fading and darkness creeping over our shoulder, we headed back to the village. 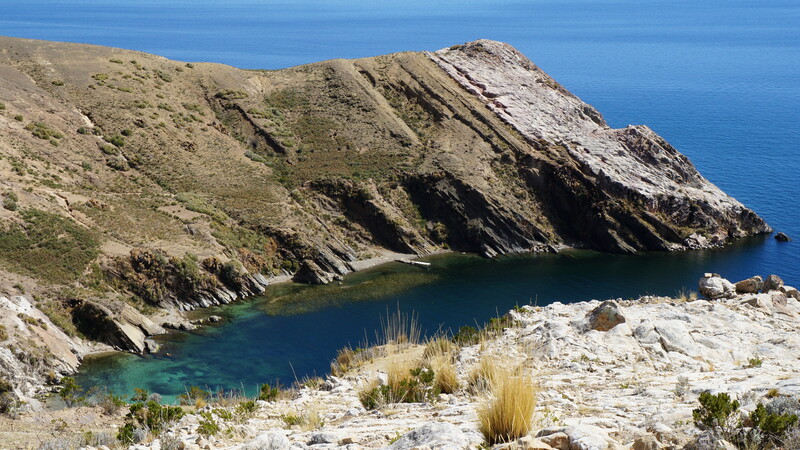 A two-hour boat ride from Copacabana is the beautiful and laid back Isla del Sol. Several agencies sell boat tickets in Copacabana or it is possible to simply turn up at the dock at around 8.00am in the morning and purchase your passage. 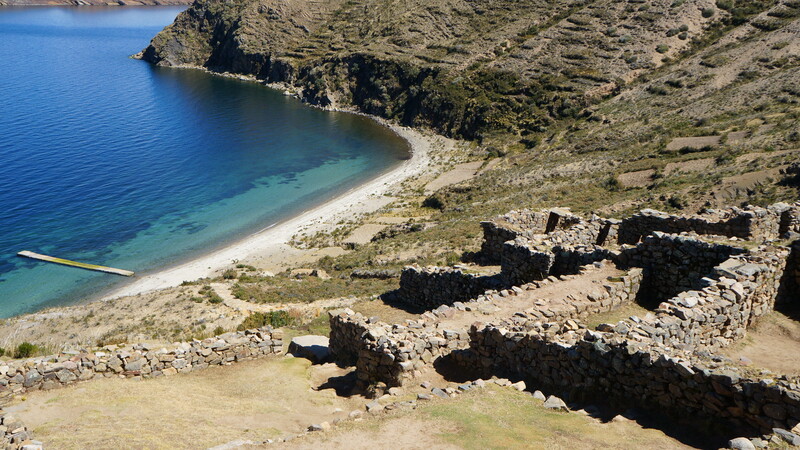 For the Incas, this island was the birthplace of the sun, the giver of life and energy to the world, and it was thought of as one of, if not the most, sacred ceremonial sites out of all their empires. 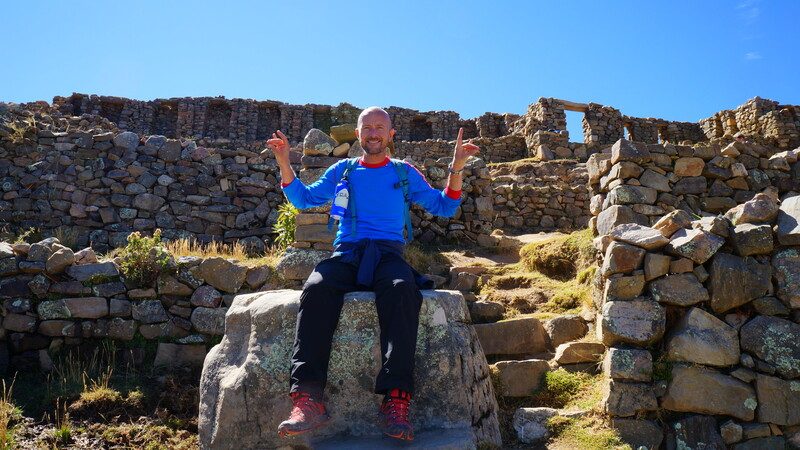 Today, across the whole of the island, it’s still possible to see stone wall Inca ruins that have stood for thousands of years. The ruins haven’t been restored so it’s necessary to imagine their original grandeur and complexity, however, their location on sun bleached hill tops overlooking a patchwork of fields leading down to sandy coves and the shimmering blue lake is breathtaking. It’s possible to let your imagination transport you back in time to where tribal elders performed mystical ceremonies and sacrifices to appease a firey setting sun. We could almost hear the chanting as we walked amongst the ruins. 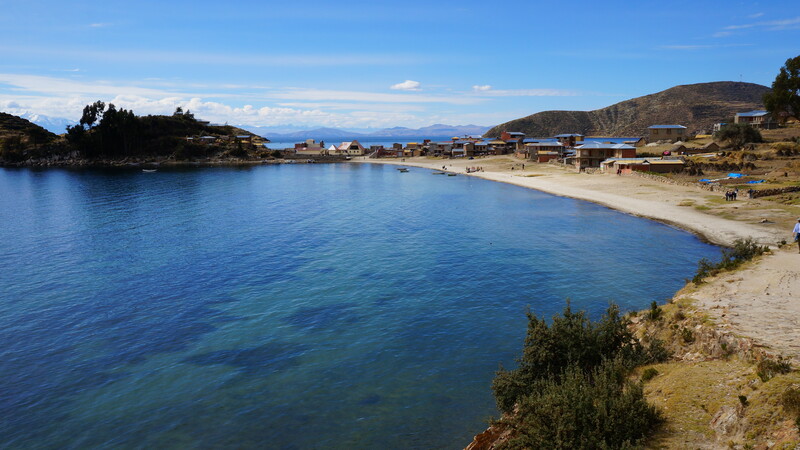 We took the 8.30am boat from Copacabana to Cha’llapampa, the village in the North of Isla del Sol. As usual in Bolivia no-one had actually monitored how many tickets were sold so some passengers ended up sitting on the roof of the small boat. As we pulled up in the small harbour next to colourful fishing boats, we marvelled at how clean the water looked. The village was nothing more than a small collection of houses and farmland. A couple of basic guest houses had been built onto locals homes and camping was allowed on a sandy cove. Horses and pigs wandered around freely and several villagers sat watching the world go by – it really was a picture of rural bliss. We spent 10 minutes visiting a small museum in the village viewing artifacts discovered underwater near to Isla Koa off the northern end of the island. Then we followed an undulating stone path to the northern ruins at the end of the island. The route was easy to follow but several backpackers took up the offer of guidance from a local for a small amount of change. With the altitude and the hot sun we took our time on the walk. Each way the path turned we were met with another splendid view. 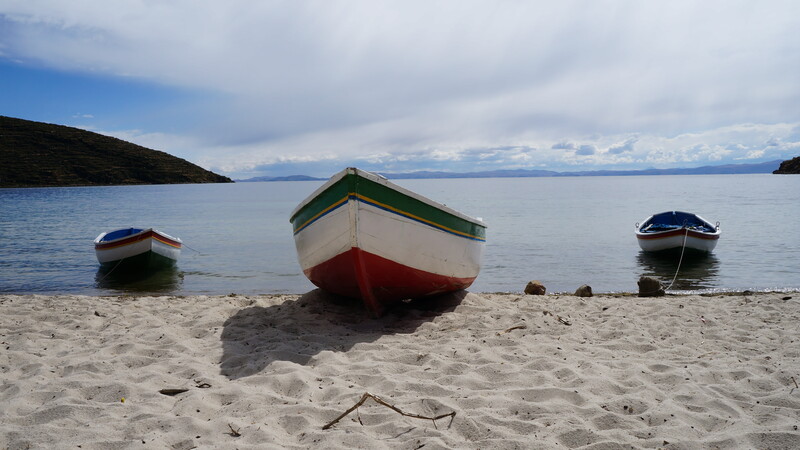 On one stretch of deserted white sand which looked like it could have been a beach in Thailand, a young hippy with dreadlocks stripped off all of his clothes and went running into the lake with a new-found spirituality. Dan covered my eyes but I was able to peak through his fingers. 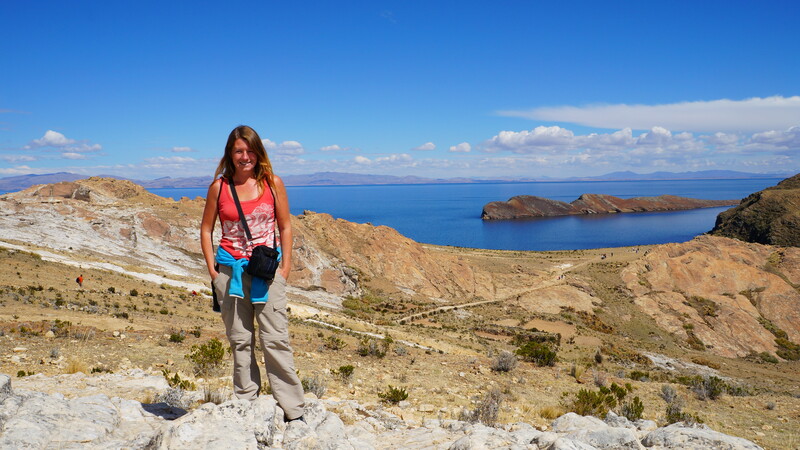 At the far northern end of the island, just past the ruins we climbed a tall mound and were rewarded with views in every direction. 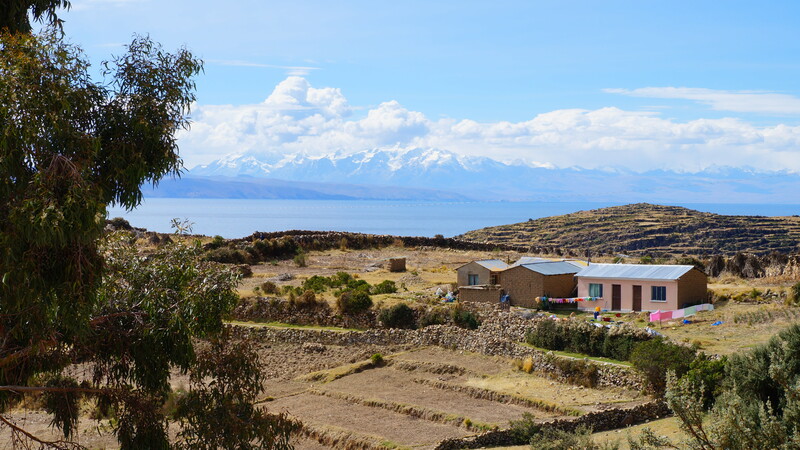 The scenery here had it all -sapphire cut waters, distant snow-capped mountains, rolling farmland, atmospheric ruins and photogenic locals. 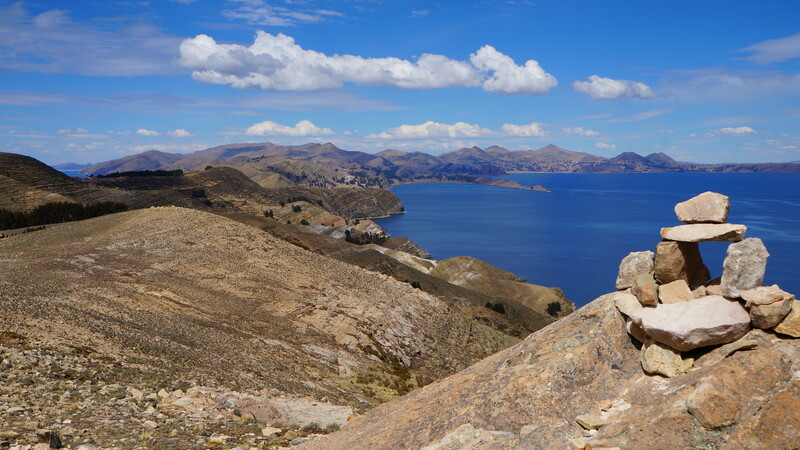 The Chincana complex in the north is the site of the sacred rock, where the Inca creation legend began. 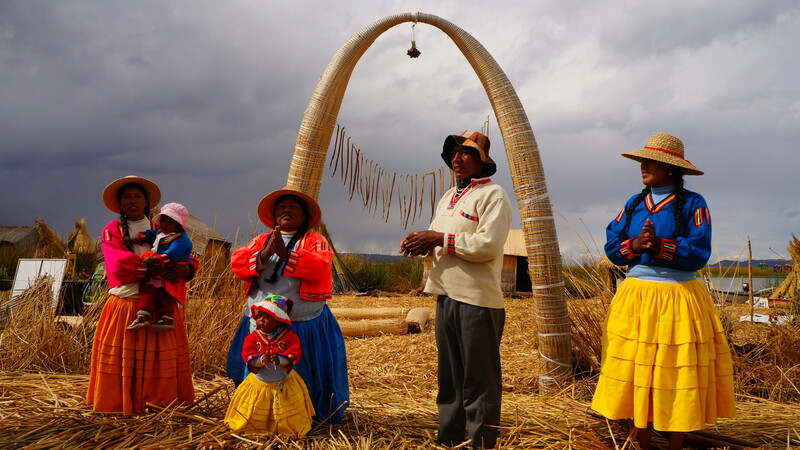 These days many Bolivians will still make a pilgrimage here to lay their hands on the rock and pray for better health or prosperity. Our wishes as backpackers were simple and frivolous. A cold beer waiting at the end of a long day, a good internet connection back at our hostel and a cheap but delicious fish dinner. Across the length of the whole island runs an old Inca road and it takes from 3-4 hours of walking up and down hills to get from one end to the other. The island is split into three sections and is populated by three indigenous villages. 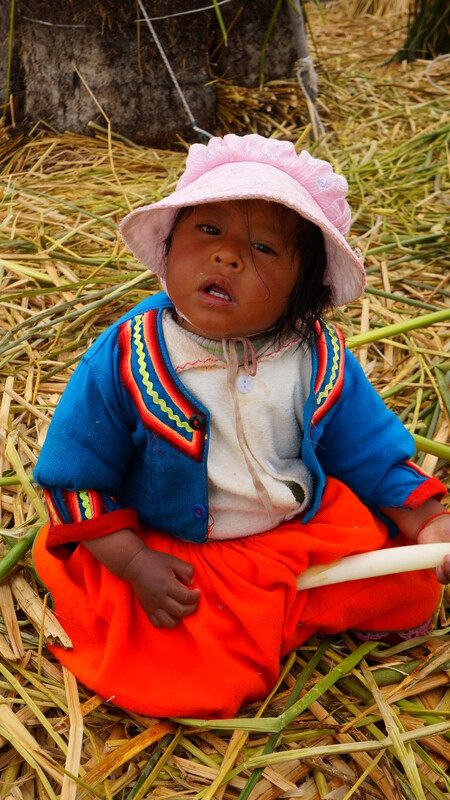 On each section of the Inca road it is necessary to pay a small fee to each of the separate villages, which alledgedly goes towards development of their village, and makeshift booths have been set up where tickets can be purchased. You have to give them credit – if there’s a way to make money, they’ll find it! At times the path was tough going and it was a welcome relief to find locals along the way selling drinks, biscuits and chocolate. Some of them looked like they could be approaching 100 years old and we wondered how on earth they made it all the way up here…perhaps they had an Inca style mobility scooter hidden in a nearby bush! 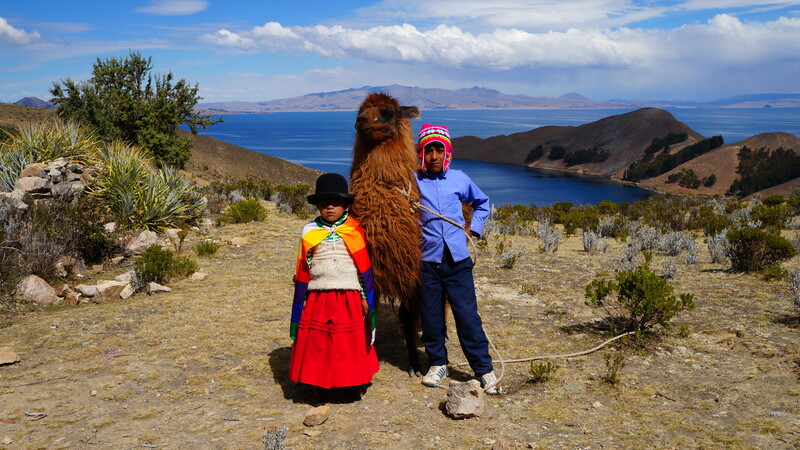 On our walk we found two young kids with stern looking faces, and their llama, posing for tourist photos and then demanding money. Their mother, who was obviously the cunning mastermind behind the ruse, sat in the background rubbing her hands together. The photograph was too good an opportunity to miss so, going into it with our eyes open, we snapped away and dutifully handed over the money to the young entrepreneurs. Looking at the farmland we noticed that not one inch of earth had been wasted and, even on very steep sections, terracing had been introduced. It was interesting for us to see how little the people who lived here had and how hard they worked in the fields just to provide for their families. We realised that our trekking shoes and the waterproof jackets which currently lay redundant in our bags (it was ‘Sun Island’ after all!) probably cost more than these people could hope to earn in a year. It was a humbling thought and not for the first time, we thought how lucky we were to be on this trip. 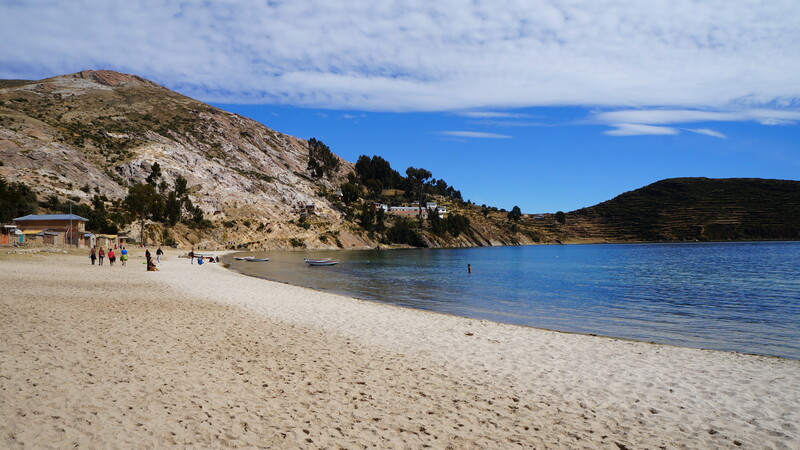 The southern village of Yumani is the biggest on the island and in recent years has experienced a mini boom with plentiful restaurant and accommodation options. 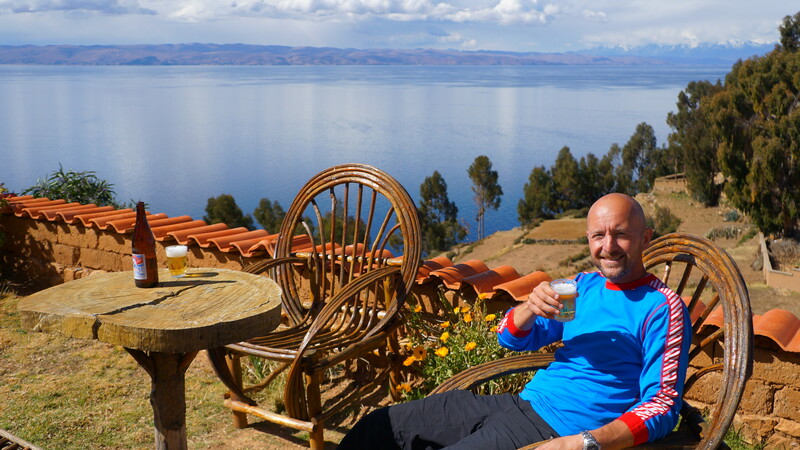 It seemed to us that some of the best options were perched on the hill-top in Yumani and offered great views. 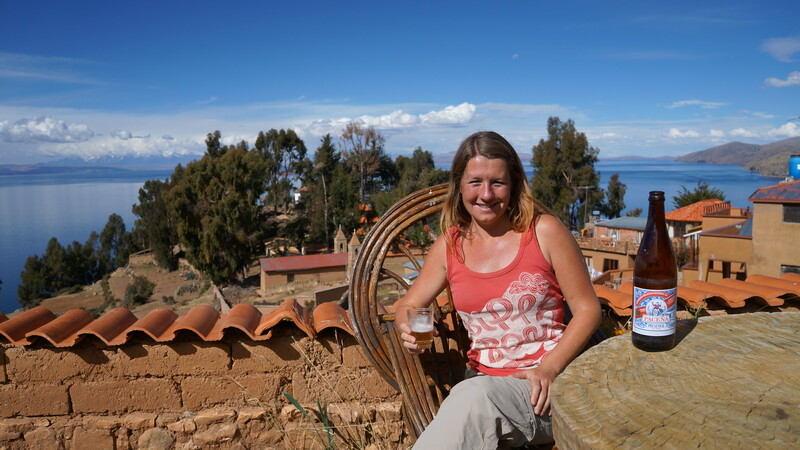 Before taking the Escalera del Inca (Inca stairway) which led down to the jetty at Fuente del Inca, from where our boat would be waiting to take us on the return journey at 4.00pm, we had time to find a seat in the sun and quench our thirst. The Sacred Rock had answered our prayers and two large, cold beers were laid before us…they weren’t going to last long! We crossed the border from Bolivia to Peru by bus, always skirting the lake and stopping briefly at immigration to add to our ever-increasing stamp collection. 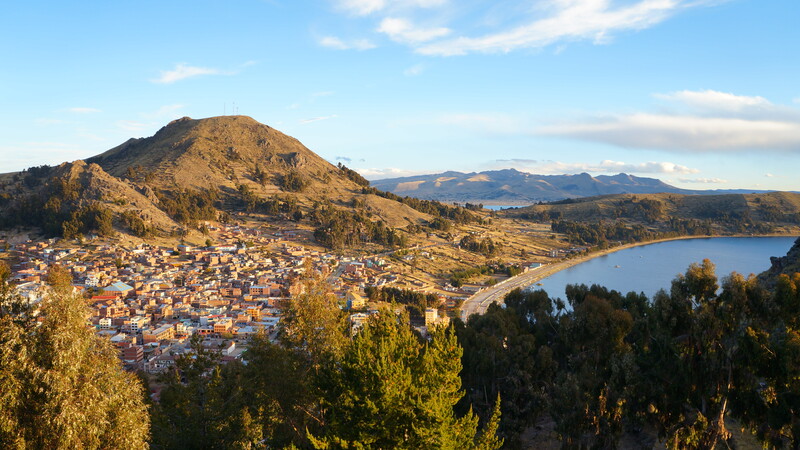 We arrived at the bustling port town of Puno, the largest gateway to Lake Titicaca and the numerous small islands in Peruvian waters. 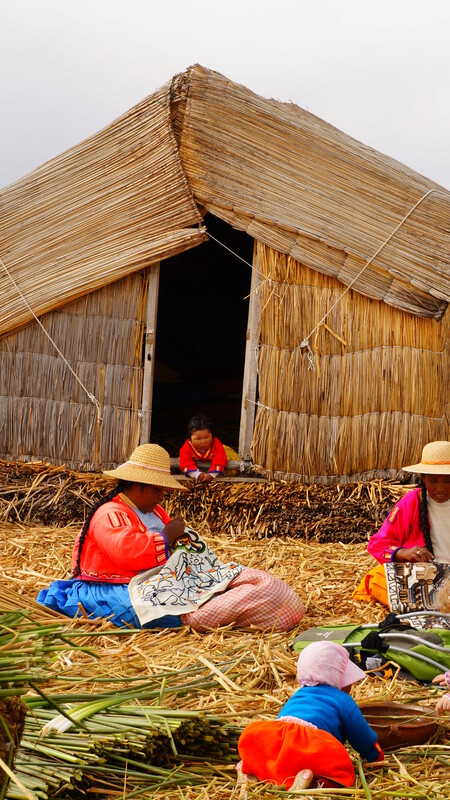 Despite it’s bigger size we liked Puno’s smattering of colonial buildings, the ladies dressed in multi-layered coloured fabrics and the waterfront which was adorned with naval memorabilia and home to the iron-hulled Yavari, once a naval vessel and now a museum and small guest house. We arranged a tour from our hotel to visit the floating islands, although it is possible to walk to the waterfront pier and get on the next departing boat (several each day) without pre-booking. 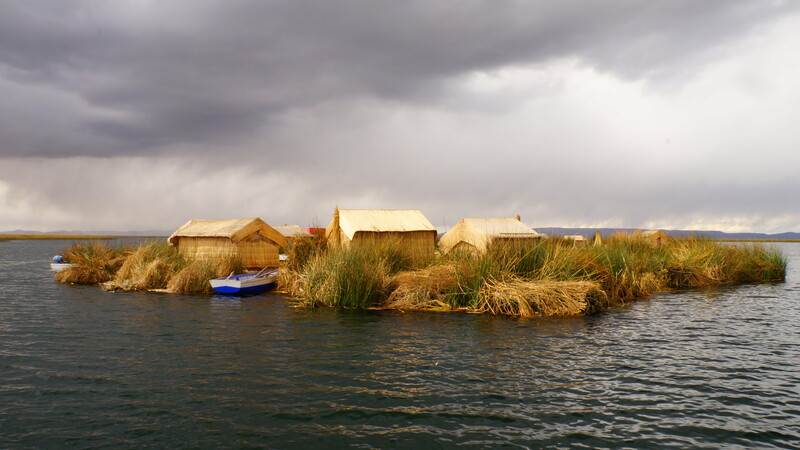 The floating islands are located about 30 minutes slow boat ride from Puno and consist of numerous small islands made from buoyant torta reeds, that seem to grow everywhere on the lake shore, and are home to the Uros people. Our first impressions of the islands, as six locals stood in a long line waving and singing “Row, row, row your boat” was that they’re incredibly commercialised and staged for the tourists. It reminded us of the kind of welcome you might receive from the Hula girls in Hawaii. Despite the fact that the locals who lived on these islands changed into more Westernised clothes and probably pulled out flat screen TV’s from under their beds when the tourists departed (cynical we know), visiting these islands still offered us the opportunity to see a way of life we had never experienced before. 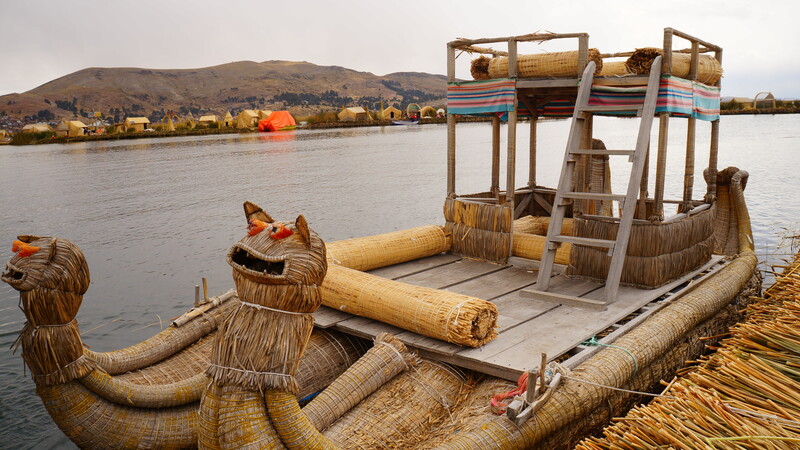 The floating existence dates back several centuries to when the Uros tried to separate themselves from the aggressive Collas and Incas. 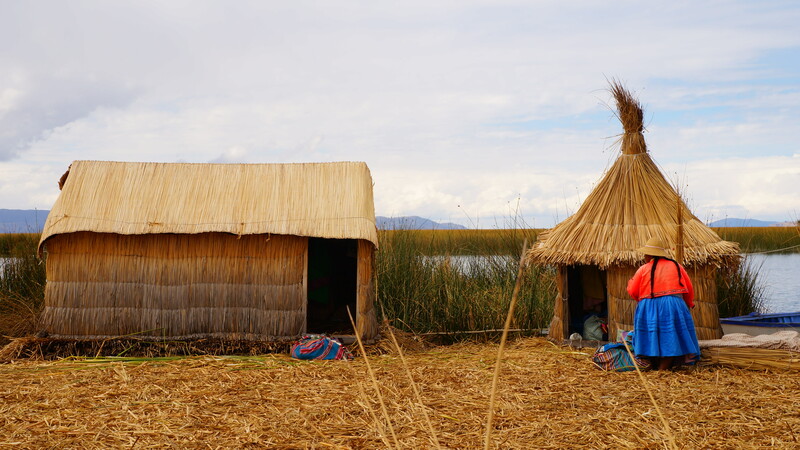 Today, several hundred people still live on the islands with individual extended families living together on their own clusters of reeds. 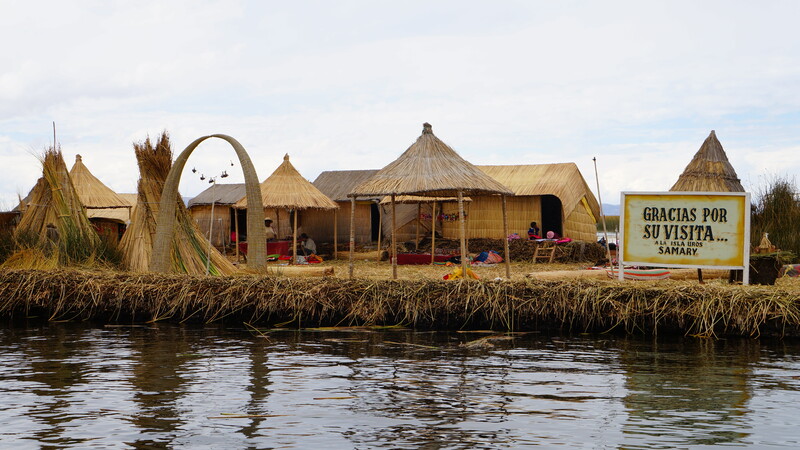 Even though the Uros people now visit the mainland more than ever before, for shopping, schooling and medical facilities, the islands do still have their own floating shops, restaurants and a doctor’s surgery. 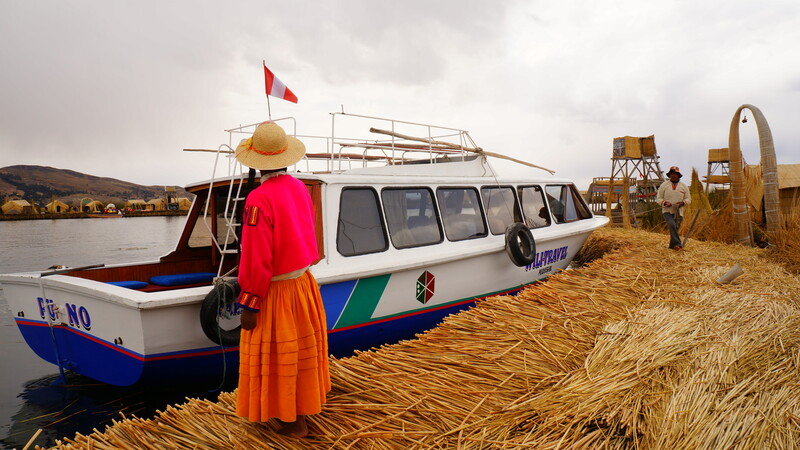 It seems that each of the Puno boat companies have a specific island community they visit and we turned up at Samary. The lives of the locals revolve around the reeds they live on top of. As we stepped off our boat we found the ground to be soft and spongy. 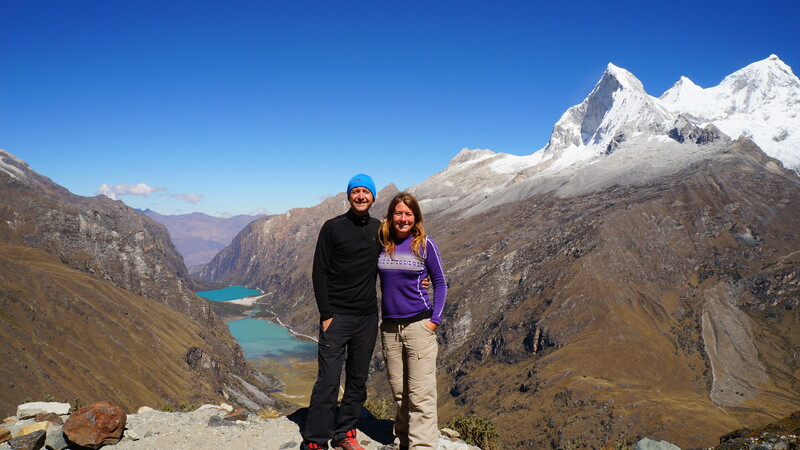 We imagined that at any point we’d break through to the lake below so we trod very carefully. 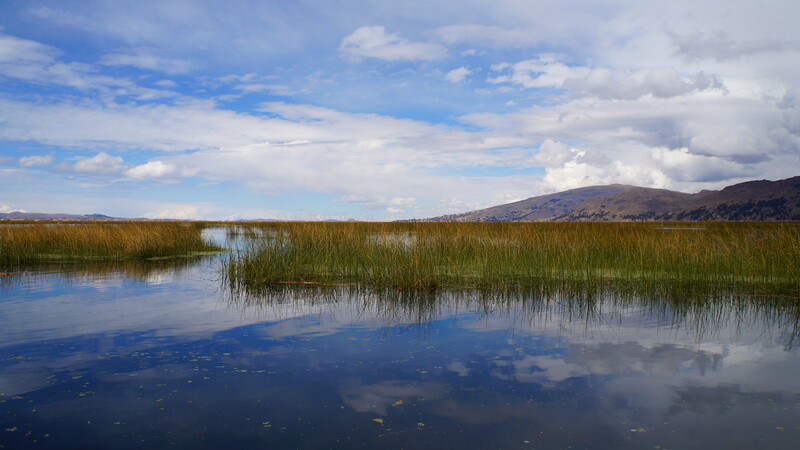 We were informed that the reeds are constantly being replenished – with the top ones rotting and fresh ones being added every seven days or so. The reeds and roots are up to five metres deep in some places and the islands actually have to be anchored to stop them simply drifting away. 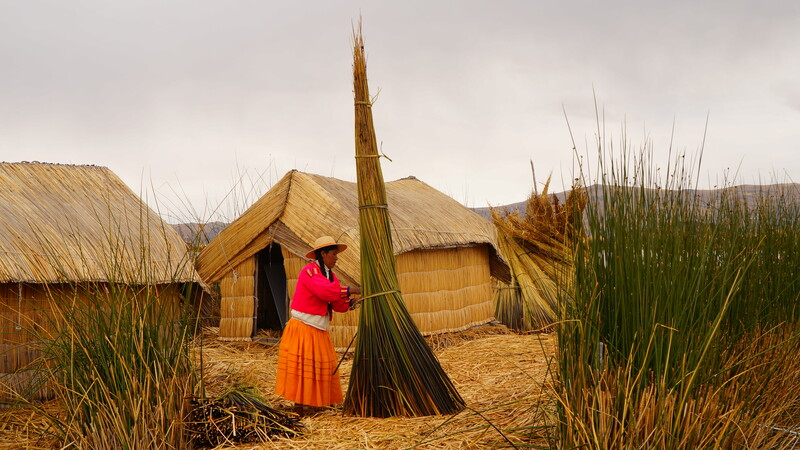 The reeds are also woven tightly together to make homes (although many now have tin roofs to make them more water-tight), and ceremonial boats and crafts which are sold to tourists. 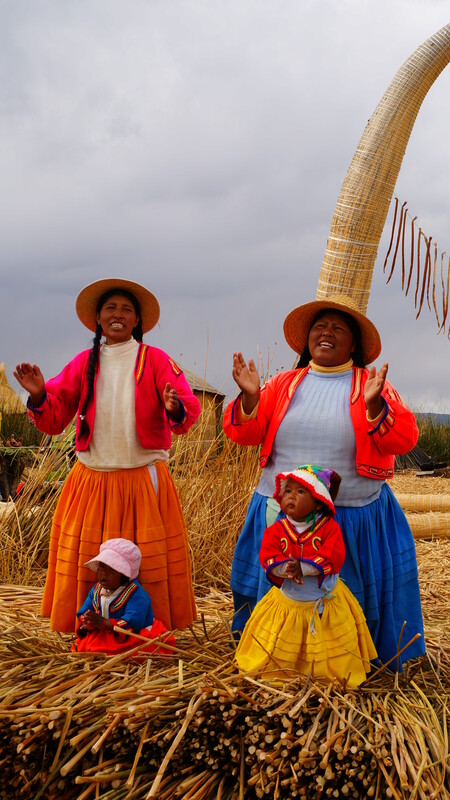 We were shown around Samary island and introduced to all of the family including two incredibly cute children in traditional clothes who seemed to think it was brilliant fun to run around bare foot on the bouncy reeds and not hurt themselves if they fell over. The island had been divided up quite logically – with an area for sleeping, a central area for gathering and socialising and a separate area for cooking. 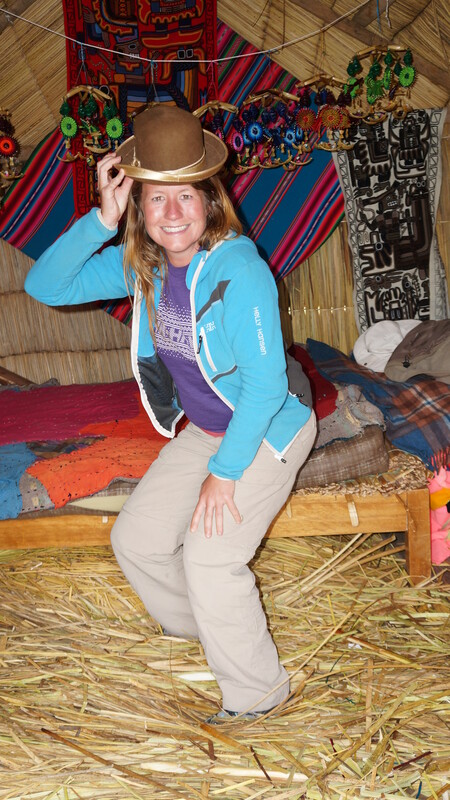 Whilst in one of the sleeping quarters I couldn’t resist trying on one of the bowler hats which lay on the beds – I’ll make it in show business yet!! Large towers were built on each of the islands and we assumed they were used as lookouts for defending their patch. The locals explained that these days the towers had a much simpler purpose and that was for communication. The abundance of reeds can muffle sound travelling across water so often the families built a tower to shout clearly to their neighbours. And for the kids, they’ve got to get a better mobile phone signal from up there! After we’d browsed the handicrafts and a few people in our group had made some purchases, we were taken for a spin around the community on a traditional reed boat. We felt very sorry for the two guys rowing as they moved eight of us and themselves by hand. The other villagers continued with their daily tasks and didn’t bat an eyelid at us white folk on the large reed dragon. They must have seen this a few (hundred) times before. The handshakes and hugs from the family as we left their island seemed to carry a large amount of sincerity, despite the fact they repeated in chorus “Hasta la vista baby” whilst waving from the shore. The experience for us felt like visiting a living museum. 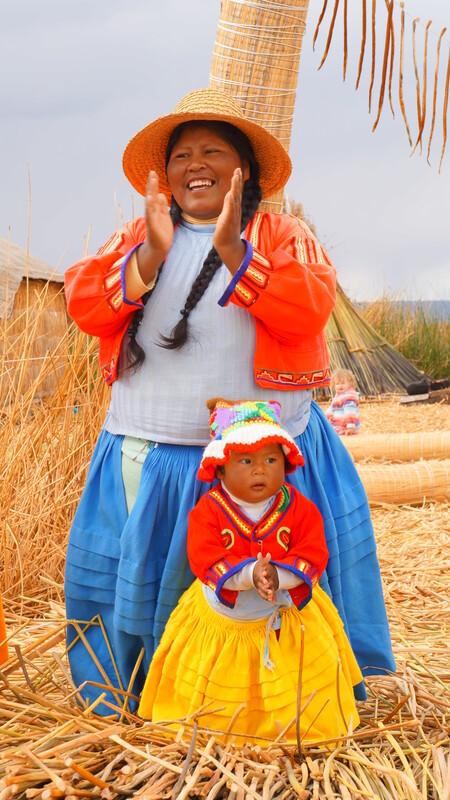 The passage of time and modernisation has undoubtedly changed the lives of the Uros forever, to make things easier and more comfortable for them. However, the traditions and customs are still held dear and we felt pleased they were able to offer us an insight into their world. 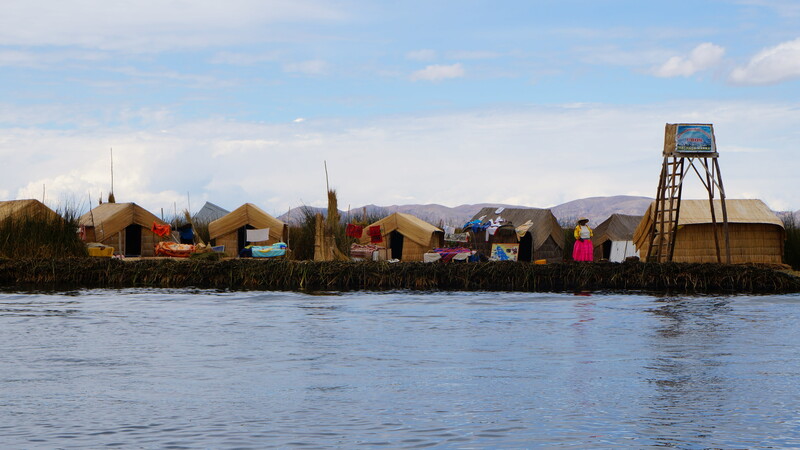 ← Inner tubes, bamboo and string – river travel the Bolivian way!